I’m happy for you that you got to go to Edinburgh. it’s such a wonderful city, one I’m overdue for a visit to (my one and only time there was in 2005). Did you manage to be there for any of the Book Festival? I love Kathleen Jamie’s poetry, especially the collection The Overhaul, as well as her two books of nature essays. I’m glad you enjoyed Edinburgh – it’s a great city and quite a few of the museums are free! 🙂 I haven’t been to the Poetry Library though – it sounds wonderful. I’ll make a note of it for my next trip! Aaaa I need to read The Windfall! I have it checked out of the library and it’s on its last renewal so I legitimately have to get to it ASAP. The problem is that I have many other books on their last renewals too and HOW CAN A GIRL DECIDE?? I’ve already commented to this effect on Instagram but that’s one of my favourite of that writing series from Graywolf too. It sounds like an exceptional reading month overall: how can September hope to compete?! 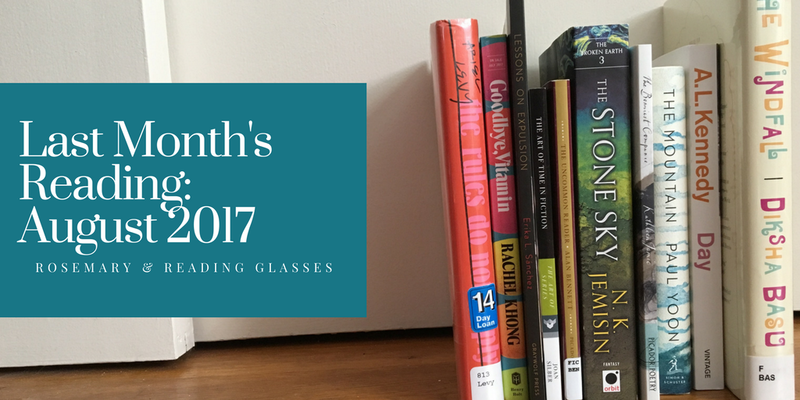 Your August sounds wonderful – good books and new places. Scotland is a place I would love to go. My younger sister lived there for 2 years, and she loved it.